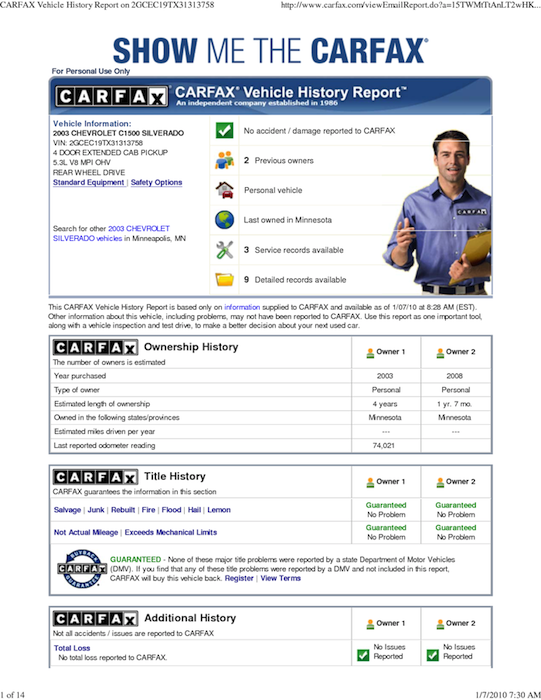 Carfax, Incorporated is a commercial internet supplier of vehicle history data to individuals and businesses. Dealer use the separate site, www.carfaxonline.com. With branches in America and Canada there is also a Europe website. Revenues in 2013 were reported as US 400million with over 700 employees nationwide. Information provided includes: number of previous owners, number of major accidents, accurate odometer and recall information. To reach support call 1-800-789-6232. You may also find more help phone numbers here. To write to CEO, Richard Raines, address your correspondence with: 5860 Trinity Parkway, Suite 600, Centreville, VA, 20120, USA. The corporate office phone number is 703-934-2664. Founded in 1984 Carfax was recently named by Washington Post as a Top Work Place in DC in the “medium sized companies”. Utilizing police reports, fire reports, auction and collision repair site records, Carfax offers a Buyback Guarantee and Lemon Check service. Social media presence is found on Facebook, Twitter, LinkedIn. Based on a review on West Financial Auto Group a couple days back I had purchased a 2007 Hummer H3 H3X. No complaint on the purchase of the Vehicle, Kal and the guys were more than helpful and the process was going slow because the car was sent out for repair and Kal was getting the run around by the mechanic as to how much longer it would be to get the car fixed and returned to the dealership. Kal was getting information from the mechanic and would relay the information to me,, so we both were in a waiting process as to the delivery of the car. As for the dealership and sales personal I want to thank them and change my review to a 4 star rating and yes I would purchase another car. I believe there has been a blatant Florida Deceptive Trade Practices Act violation in relation to a recent purchase I made with Arlington Toyota. I was purposely swayed and lied to in relation to the condition of a used vehicle I purchased, specifically a misrepresentation in the realm of quality and care. I was shown a CarFax, and after careful research on my end, I was deceived into believing my car had never been in a collision, nor had any more than one owner. My research indicated my vehicle was involved in a rear end collision, resulting in blatant structural damage (the frame was possibly "bent back into shape"), which I was only privy to after purchasing a CarFax report, not to mention that from further research, indicated one other accident, and two other owners. I believe this is fraud by concealment, and unfair/deceptive trade practice, and possible forgery and tampering with a CarFax report. I was taken advantage of, and I would appreciate speaking further as to be aware of what my next step is. For context purposes. This ordeal has been going on since the purchase date of my vehicle, 6 June 2016, up until yesterday 30 August 2016, when I had my final interaction with Arlington Toyota. I had been having some problems with the car I purchased about a month and a half after the purchase date, a 2008 Infiniti G37S (about 80 thousand miles). Namely what seemed to be bad brakes, and squeaking underneath near the frame. So - I made my way to CarMax on the 25 August 2016 (last Thursday) to get my car evaluated for a possible trade-in or sell, as I was not sure what the squeaking was. After about 30 minutes, the mechanic (whose name is listed on the CarMax appraisal I received) approaches us, and tells us they cannot offer us a legitimate deal due to "structural damage to the frame." We were shocked, as the "CarFax" that I was originally shown on 6 June 2016 at Arlington Toyota by the salesman Arjun (he quit last Friday, 26 August, after we had called to say we were coming in to express a concern) had no indication of this structural damage, yet when I returned a month and a half later to Arlington Toyota to express my concern (26 August 2016), I was rudely told - "No, you DID sign a Carfax, we will have it to you by Monday or Tuesday (29/30 August 2016). It is in our off-site warehouse." They were not accommodating in the slightest, and this man who sold me this defective vehicle quits the morning of the day we were to meet? They have no "off-site warehouse." I asked a fellow employee right after I was informed of this, and they said this "warehouse" was indeed on property, and even within the same building I was standing in. I expressed that I never signed a CarFax, and would NEVER purchase a vehicle with frame damage, but I digress. I returned on Monday, nothing. I returned yesterday/Tuesday (30 August 2016), only to receive a mere copy of this supposed CarFax, but was not offered to look through the original. Yes, A signature was on it. It is what seemed to be mine, but with some definite "tweaking," to say in the least. I continued to ask for the original, and was arrogantly told I was "not allowed," as if I had no right to ask for documents I had "signed." After an exhausting back-and-forth, my girlfriend and her mother had accompanied me and continued to ask what reason and business was it of theirs to purposely and forcefully keep an original document without allowing us to see it. Finally, a Chance Morgan (who we had been dealing with on Tuesday 30 August, but from 26 August 2016 to 29 August 2016, we had been speaking with a Roger Page), interrupted them both very ridiculously and quite theatrically dramatic, gets up, huffs and puffs to what was originally their "off-site warehouse," and returns with the "original," but would NOT LET ME HOLD IT. I know for a fact this is not my signature, and was clearly forged so as to prove they have no guilt. I have several items, checks, warranty signatures, that prove this, that it can be compared to. It can be taken to a handwriting expert if necessary. Also - there was a shady amount of discrepancies dealing with my finance and car payment paperwork, and they didn't allow me to make my first payment until 25 July 2016 (notice this is nearly a month and a half after purchase date). I was explicitly told this would be considered my first payment, and then I get a call from their finance department saying they backdated all of the payments (even after admitting to me that the misfiling of their paperwork was their fault), and I owe them two or three subsequent payments by September 6, 2016. I was sold a vehicle without the prior knowledge it had frame/structural damage. I believe this is negligence, deceptive trade practice, possibly affirmative misrepresentation, fraud by concealment, possible forgery (I am positive), and a direct violation of the Deceptive Trade Practices Act. I have researched this for hours; I know the statutes that possibly apply to my situation, various other similar complaints about the employees and staff, and the action I am willing to take so other customers and FAMILIES are not deceived. I have this in writing, as well as the copy of this "CarFax" I apparently signed, my warranty information (they refused to give me a copy of much of anything else, but it is all in their "warehouse" onsite), and the RECEIPT stating when my first official car payment was. Inaccurate information was given on my vehicle on a print out at a car dealership showing my car had been in a front end accident and was towed. On the date in question I was hit in the rear bumper with minimal damage and the car was very driveable. This inaccurate report resulted in the car dealer reducing my car trade in value by $2500. Carfax has been slow to address this complaint and chat on there help line has been less than helpful and at time very curt with the rep anxious to end the chat. Their standard response has been "The research team is a separate department" and I cant contact them so they cant help me I just have to wait until they get to my case. Requests to speak to a manager got me no where as well. Makes me wonder how accurate they are when rating other cars that consumers buy or sell. Lousy customer service overall wasting my time, effort and potentially money to fix their inefficiency. Carfax is an example of a great company with a good product. I don't think that this is a complaint as much as it's a problem with how cars are bought and sold today. It's a sad day when you have to find out that your Carfax report kept you from getting taken advantage of or lied to. I have bought several cars and luckily the Carfax report always came back with mileage accurate and a clean title. I wish that the company would make these reports free so that you do not have to buy them, although some car dealers include a free Carfax report when you purchase the car. It includes things like water damange and if the car has been totaled or not.